In this complimentary 1.5-hour VETgirl-Merck online webinar, we reviewed the recent outbreak of Canine Influenza Virus (CIV) in Chicago, IL. If you have a coughing, febrile, dyspneic dog presenting to your clinic, what do you do? In this webinar, we reviewed the etiology, clinical signs, diagnostic testing, and treatment for CIV. We also discussed how to educate your pet owners on this outbreak and what preventative measures you can do to prevent the disease spread. 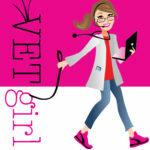 VETgirl is a subscription-based podcast and webinar service offering RACE-approved veterinary CE "on the run." * Purchase ($30/1.5 hours CE) will provide a 24 hour rental license for non-interactive, passive online continuing education. is it possible to join this webinar with a trial membership? we got an email at my clinic that this webinar was complimentary. Yes, but you need to sign up ASAP by just clicking on the CLICK HERE in the title to register ASAP. Space is limited. We were logged into the webinar, after 10 minutes in we were kicked out. Then when we tried to rejoin it said webinar is full. Hi Pam – we sent you an email – please let us know if you have any questions! I was logged in to the webinar and my computer temporarily shut down for some maintenance and when I attempted to log back in I was told the session is full. Can I log back in please? Hi Ann – we sent you an email – please let us know if you have any questions! Will the slides from the CIV lecture be available for everyone to review or just elite members? Thanks so much for the amazing info! I’m not seeing the quiz section for those that didn’t watch it live…. ?